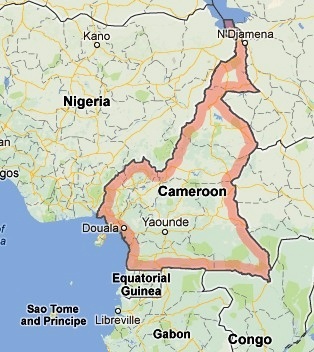 Cameroons (UKTT) was a territory mandated to the British by the League of Nations in 1922. The area was a German Protectorate in late nineteenth century with the British, French, and Belgian troops occupying the area during World War I. Part of the area was mandated to France as Cameroun and the British mandate included Northern Cameroons and Southern Cameroons divided at the present-day Cameroun-Nigeria border. Following a plebiscite, Northern Cameroons became part of the independent state of Nigeria in 1960 and the Southern Cameroons were termed U.K.T.T. (United Kingdom Trust Territory). UKTT became part of Cameroun on October 1, 1961. Red “Cameroons U.K.T.T.” overprints on a Nigerian set oftwelve stamps (Scott #80 to #91) of 1953 were used in the area during 1960 and 1961. The issues were withdrawn from Northern Cameroons on May 31, 1961 when that area became part of Nigeria and in Southern Cameroons on September 30, 1961 when that area joined the Cameoun Federal Republic. The parent set from Nigeria is sought after and catalogs for around $55 MNH and around $15 Used. The designs show Manilla Bracelet Currency, Bornu Horsemen, Peanuts of Kano City, Mning Tin, Jebba bridge over Niger River, Cocoa Industry, Olokun Head in Ife Bronze, Logging Industry, Victoria Harbor, Palm Oil Industry, Cattle Industry showing Goats and Fulani, and Lagos Waterfront from the 19th and 20th centuries. The British Crown Head design or the QE head portrait design is featured in Inset on all stamps of this set. The U.K.T.T. overprints (Scott #66 to #77) were issued on October 1, 1960 and catalogs from around $20 MNH and around double that for Used. 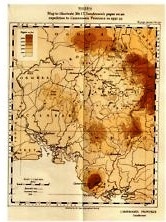 Early 20th century colonial maps and late 19th century German maps are a very collectible item from the area. First prints coveringnative art, flora, and fauna are also sought after. Original photographs from the period covering the early 1950s to independence era of the early 1960s showing political or other union activism is another sought after item from the area. Original art work including postcards covering native pygmy and other ethnic themes are also sought after.